I have bees in the garden! I am not sure what kind they are but their number is growing. A few days ago when I first saw them I could count how many they are peeking from the weep hole in one of the terracotta pots we inverted to serve as stand for the other plants. Now there seem to be many guarding the entrance to their hive. I wonder how the hive looks like in the inside. But I will not attempt to even open it. A week ago, the termite exterminator I hired came by to render his last contract inspection. I told him about the bee nest so he carefully sprayed around the garden so as not to disturb them. But I was still afraid that they might get affect. But apparently they were not affected as the number of bees guarding the nest more than doubled. Sorry if the follow up answer on the Pili-pili dilemma is late. I will try to catch up on posting some of the new blogs. With regards to Zip's assignment on how the town was named, her boss told her that Pili the town was not named after the pili tree but rather on the fact it was the chosen (Filipino word for 'chosen' is pili too). Honestly I was disappointed when I learned this as I was gunning for the tree connection. Goyi Solis, who was one of our coordinators, was also curious about the town's name so she googled to get to the bottom of it. She said it came out that the naming of Pili town is already obscure, that the 2 theories, about the tree and the fact it was chosen, stand accepted. 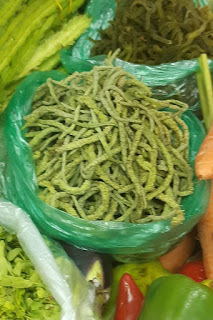 In any case it could not be discounted that the pili tree is associated with the existence of this loved town in Cam Sur that whether it was named after the tree or not, the ubiquitous presence of the fruit (and hopefully the tree itself) would help in promoting a cultural character for Pili. I was invited to talk about native trees in Camarines Sur. It was my first time in the province. When I arrived with the other speakers from Manila, I learned that we were to be billeted in the municipality of Pili. Knowing pili is also the name of a local endemic tree (Canarium ovatum and some relatives) and that Cam Sur is in Bicol, which is pili country, I was curious to ask our welcoming party why the town was actually named Pili. I was not able to get a straight answer. I further asked if there are still pili trees around in the town and before I could get a reply, I a grown pili tree came into view around the corner. I then rephrased my question to whether the Pili town is known for pili trees or is there a pili industry locally. The answer given to me was that pili is more known to be grown in Sorsogon which was two provinces away. So I wondered, if Pili town was named as such but is not anymore known for the pili tree, what actually defines Pili as a town. This time I got an answer in form of a question: CWC? - which stands for CamSur Watersports Complex. I just left my curiosity hanging for the meantime. The main watersports pool has the more experienced, especially foreigners, doing acrobatic turns and moves in the water. An hour or so later we met our hosts from The Trees That Bind Inc., an NGO with an advocacy on native trees (I have not yet explored the actual goals of the said NGO so I would reserve in another entry explaining about it). I met with Goyi Solis, who extended the invitation for the talk, and Zip, from the local government unit. I asked them about my Pili-pili dilemma, which Zip vowed to make her assignment from me. We arrived in CamSur late in the afternoon (our flight was delayed) so we only got the chance to walk around CWC grounds - which appears to be exciting. Our companion, Dr. Ephraim Cercado (from the Native Tree Enthusiasts Group) could not help himself to try wakeboarding. It seemed to be a fun thing to experience but I did not have the courage to try myself. So far with what I have heard, it is CWC that is the main attraction of Pili as a town. Let us wait for what Zip has to say about it. Quick Post: I was having class yesterday in Building 1. It was a drawing studio class so when my students were doing their drawing plates, I noticed that the natural light was nice in the college's amphitheater. The bagras (Eucalyptus deglupta) trees the faculty planted several years ago are reaching about 8 meters in height or more. But still towering over them is the sole kapok tree (Ceiba pentandra) which is about to wreak its fruiting havoc in a few days. The heavily fruit-burdened branches will release the snow like fibers attached to the wannabe-airborne kapok seeds. It is like snow, a spectacle to see - but will be quite detrimental to ones having asthma. Soon the whole college floor will be teeming with the fluffy kapok fibers. Time to bring out my again fashionable face mask. Ever since I transferred houses, it has been quite a while since I visited Munoz Market. 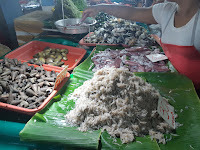 I love going there just to buy a few fish and seafood items as our new neighborhood talipapa has limited fare. Today a Wednesday, it looks like seafood abound despite being the middle of the week. I found some unusual shellfish but was afraid to try, so we stuck it out with the usual suspects, tulingan, squid and tahong. On the other side of the seafood section was the vegetables area. In the sea of common produce I found some kadios and alukon. I do not remember anymore what month alukon usually comes out, as alukon is the male flowers of the himbabao tree or Broussonetia luzonica, and it has a flowering season. What I could remember though is how closely it resembles cauliflower in taste. 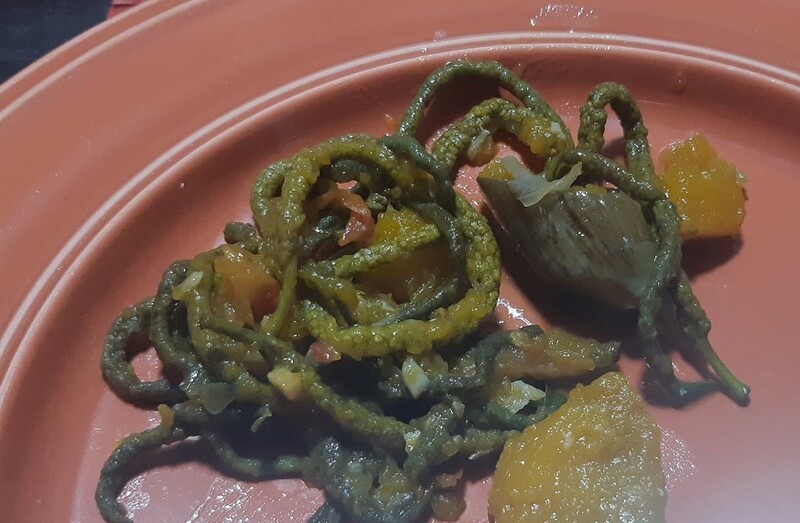 When I first tasted alukon, it was cooked in the austere-reputed dish diningding (did I say that right, Ilocanos?). 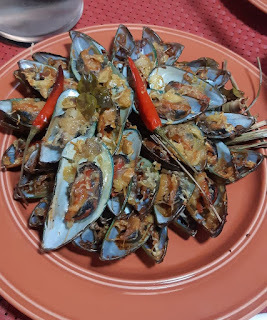 I missed eating baked tahong! We cooked alukon tonight before it dries up or wilt completely. We also prepared the tahong two ways, in curry and baked with a little butter. I would also have to find a good recipe without pork to cook the kadios in the next few days. Any suggestions? I would have liked it the Negrosense way with pork in soy sauce but would have to stick to the healthy diet. Quick Post: I was told that for outdoor use, the wood of choice would either be yakal, guijo or molave. I have seen molave wood a lot of times before having that yellow tinge. But it would also sport knots which give it character. I have not seen either yakal or guijo before. Recently I was sent file pictures of how yakal would look like when used as decking material. It is harder to find new yakal wood nowadays so the pictures sent were of lumber from an old house that was reworked into a 7 year old deck. But a few were said to be replaced recently with newer pieces showing us how a 20 or so year old yakal wood compare to a 5 year old one. It has been long since I saw my architect friend Chi Victorino. Last weekend I joined her to visit a private farm in Cavite (near Tagaytay) - which was sort of her birthday lunch. 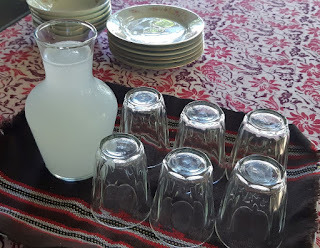 The owners, which were her friends, hosted us and prepared a sumptuous semi-healthy meal for us which memorably included a gracious serving of fresh tuba. I am not sure if the pork and the vegetables served were produced in the farm. But what I heard from our hosts is that the tuba came from coconuts growing within the premises. The tuba was extracted the day before and was sweeter than any I have tasted. Our lunch was capped off with a surprise birthday cake for Chi, which had a single lit candle (not hinting how old Chi was). Chi was all in smiles while trying to blow the sole cake candle. After lunch our hosts, Sir Eric and Mam Des, toured me around their farm as it was my first time there (Chi had been there several times before). 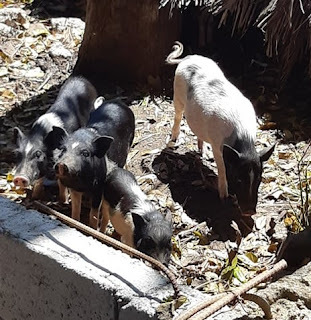 They showed us the native pigs growing in their well built pens - which I found adorable (the numerous small piglets were quite cute and endearing). Mam Des was telling me that the native pigs were not as smelly to keep compared to the domesticated pink-colored kind we see commercially. They amazingly deposit their 'poop' into one corner of the pen. They also were quite easy to feed as they are 'vegetarians', eating mostly produce and discards - which are harvested around the farm. What was nice to discover is that the farm approximated a forest look. Yes there were mahogany trees and norfolk pine all over, which was planted more than 10 years ago (before the owners knew about native trees). But in corners where they had existing native trees like tibig, bangkal and pagsahingan, they planted these areas with more natives like kayumanis, lipote, batwan, tabon-tabon and a whole lot more. I seem to be rusty taking tree pictures. When I reached home, I found out that instead of taking pics of the farm and the native trees, I snapped at pics of the mahogany tree path and flowers. But at least I got to take shots of a few natives in bloom which were protected when they built the structures. Hopefully when I make my succeeding blog posts I could get into the groove of taking nicer native tree photos.